When converting from a Mainframe environment to PC there are some critical issues that should be considered. What file type do you want us to convert to? Do you want to import the files into your application yourself, or pay DISC to do it. We can save you time by setting up the database and importing the file, but you will have more control over details like field names and types if you do it yourself. If you are going to do your own import, what file types can you read? We want to make sure we put the files into a format you can use. This will be determined by your application or programming language. You should first try to use the same format as the system you are converting from, as this will minimize conversion costs. Most mainframe data is in a fixed-length field, fixed-length record format. See if you can import that format, and if you can, see if a record delimiter is required (it usually is). If your application can only import a field-delimited file (like comma separated variables, or CSV) or some other kind, then we will have to write a program to convert the fixed field data to that format. Make sure you will have enough disk space for the converted file, and any intermediate files needed. Check your application to be sure it can handle the size of the file, and also the number of fields and records. If the file is too big for your application we can break it up into smaller files. Remember you cannot index it as one file after it's split up. If you are short on disk space, we can return the conversion on a CD and you may be able to work from the CD, saving up to 650 MB of hard disk space. Be aware, however, that if we deliver an Access or other database file on CD that it will be read-only, and to be useful will probably need to be copied to your hard disk. Another option to reduce file size is to discard unnecessary fields. In very large files this may also save money on the conversion, although it may add to the cost for smaller files. Make sure you have a layout from the originator of the tape. DISC may need this to convert your file, and certainly you will need it to use the data. Try to get other supporting information, like the JCL of the job, and record counts so we can verify that all the data is present on the tape. A dump of the first few records may be helpful in solving problems. Most likely we will have to convert EBCDIC to ASCII. If the file is composed of all character fields this is a simple conversion, but if there are any binary data fields, they will have to be converted on a field-by-field basis. This usually requires programming. Also check the layout for redefined fields, or multiple record types. Check for filler or undefined fields that might contain binary junk. If the source data has implied decimals, do you want us to convert to real decimal? How about Julian dates? Or parsing names or address? Or case conversion? See Mainframe to PC Conversion Issues for a discussion of these issues. What media should we write your files to? CD & DVD: CD & DVD formats are standardized, so any PC can read them. Presently this is our most popular form of output media for our customers. Floppy disks: Floppy disk is still the quickest and cheapest way to transfer very small files to a PC. Compressing files enables the average 3.5" floppy to hold up to 10MB of data depending on file types. USB Flash Drive: These tiny devices hold a surprising amount of data and transport well. With current techonology the transfer speed from these devices is extremely efficient for its capacity. External USB or Firewire Drive: These drives can hold very large amounts of data. Current USB & Firewire transfer rates offer efficient offload or general access to these devices. 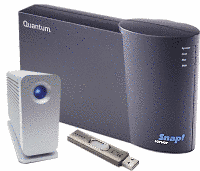 NAS Devices: Network Attached Storage devices, such as the Snap Server, can hold huge amounts of data and plug (or snap) right into most server environments. Tape formats: Many of the tapes on our media list can be found on PCs, but there is little standardization of file formats between competing products. Tapes on a PC are almost always written with a backup program, and most of these use proprietary formats. Therefore, if we want to read or write a tape for data exchange, we will need to match the type of drive, the backup program and the version, on the same platform you are using. We prefer to write to one of the many devices listed above to avoid these issues, and the conversion cost is often less, too. Electronic delivery: File delivery via the internet is commonplace and is the normal delivery method for many of the weekly jobs at Disc Interchange. Compressing the file and attaching it to an email is a simple option for small amounts of data. For larger files FTP is the most accessible and common method of digital delivery. Disc can encrypt the file if it's sensitive data such as medical records. When we convert from a tape to disk, we have to give the file a name. Remember, the 8.3 MSDOS file name restriction for older operating system environments. If you do not provide file names, we will use whatever seems best. In the case of labeled tapes with one file, we normally use either the DSN (Data Set Name) or the tape VolSer (volume number), which is unique. Lacking those, we try to use a descriptive name from the documentation. For repeat jobs we always try to use the VolSer, as the DSN is usually the same from job to job, but the VolSer is unique. Let us know if you need to perform this conversion often. If you do, you may want to invest some money up-front to automate the process so you save money over the long run.